José Morey, MD, is chief medical innovation officer for Liberty Biosecurity, a senior medical scientist for IBM Research, a visiting assistant professor in the department of radiology and medical imaging at the University of Virginia, and director of informatics for Medical Center Radiologists in Virginia Beach, Virginia. He is also a member of the Health Informatics Leadership Council at the VA, a medical technology and artificial intelligence advisor for NASA iTech, chief engineering counsel for Hyperloop Transportation Technologies, and associate professor of radiology and internal medicine at Eastern Virginia Medical School. How did you get started on your alternative career paths? I was bitten by the entrepreneur or start-up bug around the time I went to fellowship at the University of Pennsylvania. It was intrinsic at first; I had a desire to be involved with technology and all the amazing things that I felt that medicine was not taking advantage of. At the University of Pennsylvania, there were a lot of opportunities, especially with the Wharton business school where I audited some classes. I went to the undergrad campus and met with people in engineering and 3D printing. I went to the vet school and saw some of the cool technology they were using. I started creating my own applications and technologies. I had a couple of attempts at early start-ups and then started creating clinical support decision tools. Then I started working with IBM. By working during the day and networking in the evening, I got in their ecosystem. Now, instead of specifically doing radiology/academic projects for papers, I am working on research projects from a business perspective. I am interested in ideas that can be commercialized and go to market. I currently work as a consultant with IBM, Liberty Biosecurity, NASA, and Hyperloop. I also work with hospitals to evaluate emerging technologies. I would have taken this [technology] path sooner. One of the biggest problems in health care is that we spend so much time and money getting to where we go, and then we feel like we have to stay in our field to make as much money as quickly as possible. We are scared to take risks to branch out and try something different. It requires a risk/benefit analysis, and we do it every day in our lives and our educations. You can plan to minimize the risk. How do you feel that your radiology training has helped? Medicine as a whole and radiology specifically teaches you critical thinking. For the most part, any innovator needs to think critically; they need to look at what's going on, identify the problem, diagnose the issue, and figure out what the next steps are. For years, we are taught how to critically think and also make assessments and plans. Critical thinking is a skill set that can be taught and nurtured. A lot of other educational paths do not teach that or prepare people for that. A lot of companies do not care what your background is, but they highly value critical thinking and problem solving. If you have people that are good at critical thinking, a company can immediately plug them into certain roles. They may have to get up to speed on some things—like aerospace medicine or microgravity effects—and it can be scary, but it can be completely exhilarating. We do not ever know where we are going to be in five to 10 years. By stepping out of medicine, you can find a huge world with challenges that need critical thinkers. Who is Liberty Biosecurity, and what is your role as chief medical innovation officer? I first met them while doing work for NASA. They were working on a pharmaceutical for radiation mitigation. As I got to know the CEO and the rest of the team over the course of a year or two, I knew I wanted to be [involved with them]. They are working on things as diverse as radiation mitigation, artificial intelligence [AI], and anti-aging medication. When machine learning and AI technology becomes advanced enough, do you think that these programs will be viewed as replacements for radiologists? The purpose of AI projects such as IBM's Medical Sieve is to augment what radiologists do, not to replace us at all. If it ever does happen, I do not see it happening in the next few decades. It will allow us to spend more time with patients and perform more valuable tasks, instead of measuring a nodule or an aneurysm that anyone can measure. From a VA perspective, AI could do a lot of the early work that residents normally do in many hospitals because residents are a luxury at the VA. AI will also help with the democratization of medicine, helping radiologists to provide a specific baseline of medical care. That is not the case right now, where there is not even subspecialty care in some places. Subspecialty care is typically limited to the people who are in midsized to large hospitals. With the kind of AI that Medical Sieve represents, everyone will get the same level of care regardless of whether they are in a rural center or a large teaching hospital. What are you focusing on with NASA? As NASA iTech's medical technology and AI advisor, I am helping to evaluate health care and AI companies that want to work with NASA. Companies with ideas for addressing the problems associated with colonizing Mars will eventually submit papers on how they plan to solve them. I will then evaluate the feasibility of the technology, how innovative the technology will be, and the potential for commercialization of the technology on Earth. The technology will hopefully have dual viability to be used both on Mars missions and Earth. You've written about Hyperloop technology. How do you think this will affect hospital systems? My foray into Hyperloop is nonmedical, but I still view it as an extension of my medical practice. We, as physicians, can develop extreme tunnel vision in regard to caring about point of care for one patient at a time. But if you step back and look at health care in a holistic sense, point of care is kind of the last step. Social factors—diet, exercise, and other socioeconomic factors—influence a patient's state of health. From an architectural perspective, perhaps patients don't have access to good grocery stores, gyms, education, and medical clinics. We need to revolutionize how we think about patient care before the actual point of care and after point of care. Where do patients live, where do they commute, what do they do for a living? In the era of big data that is exploding, we have access to all of this information—we can evaluate peoples' taxes, social media feeds, etc, to see what encompasses a patient population entirely and what impacts them before they even come to see a physician. There is a growing pool of data that demonstrates how physical separation leads to many social ills that divide people. Technology like the Hyperloop can bring us together in more than just a physical sense. As healers, it is our duty to mend more than just the wounds of illness. 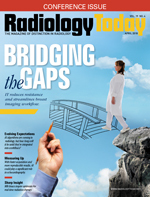 Do you still practice clinical radiology? I do clinical work 20% to 30% of the time. I still do clinical work because I think it is valuable—you cannot be an innovator if you do not feel the "pain points." Similarly, in any business where the CEO makes a decision to address a problem, the solution itself can cause other problems or may not fix the original problem. This happens because the people making decisions do not really know what the problem is in the first place. I feel that clinical work grounds me and gives me a greater appreciation for what the pain point is. I like the mental challenge of it. How do you suggest educating clinicians who aren't innovators about these topics? I would start by having medical school courses that cover topics outside of medicine. Even though a clinician may not be an innovator in creating a new procedure, clinicians can still be innovative in their own practice—in how they see, interact, and think about their patients. I think we need to start teaching more than just clinical medicine, whether that means adding or expanding another year outside of clinical medicine. Technology and society are advancing at a rapid pace. Clinicians, regardless of specialty, need to understand this pace and be willing to adapt. If we don't adapt, the probability is that we will be left behind, disrupted, and dislocated from what we do. I believe this is one of the reasons that clinicians as a whole are often highly dissatisfied with their jobs. They are being disrupted, don't understand why, and are not adapting to the change. — Justine Kemp is an MD/MBA candidate at the Tulane University School of Medicine and AB Freeman School of Business in New Orleans. Find her on LinkedIn at www.linkedin.com/in/justine-kemp-4408b0109.